Providing our community with fire protection and rescue services dedicated to the preservation of life, property and our mountain environment. Fires can start from most accidental causes but, with the exception of lightning fires in some areas, the number of starts is generally low. 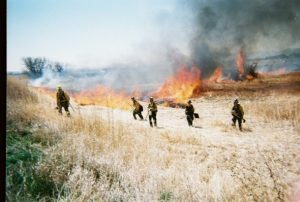 Fires in open cured grasslands will burn briskly and spread rapidly on windy days. Timber fires spread slowly to moderately fast. The average fire is of moderate intensity, although heavy concentrations of fuel, especially draped fuel, may burn hot. Short-distance spotting may occur, but is not persistent. Fires are not likely to become serious and control is relatively easy. Coal Creek wildland firefighter’s combat wildfires and prevent future ones from starting. 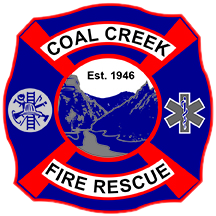 Currently Coal Creek Canyon Fire Rescue has 20 active wildland firefighters. 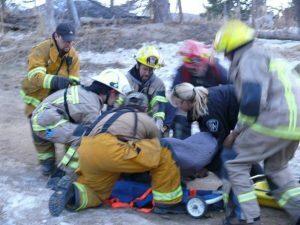 With over 35 emergency medical responders, Coal Creek Firefighters provide emergency medical care within Boulder, Gilpin, & Jefferson counties. 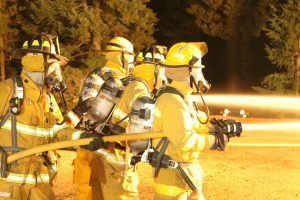 Coal Creek firefighters are extensively trained in firefighting, primarily to extinguish hazardous fires that threaten life, property, or the environment. Currently there are 35 active structure firefighters in Coal Creek Canyon. 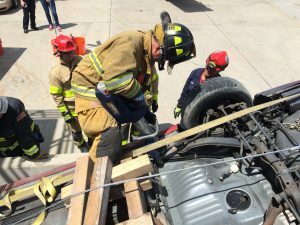 Coal Creek Canyon firefighter’s respond to vehicle accidents and provide medical aid, vehicle extrications, extinguish vehicle fires, and prevent potential wildfires as a result of accidents. Gross Reservoir: An undergoing power plant construction and recreation expansion and the major part of Denver Water Board Land. The District is home to 7,000 residents plus pass-through visitors. Although some of the residents live on large tracts of land, the bulk of the population resides in subdivisions with forested lots consisting of one acre or less. A rapid increase in residential growth has occurred in recent years, which enhances focus on the safety of homes and businesses. The eastern portion of the District is a mixture of light and heavy industries, ranch and grazing lands, and some undeveloped portions of the City of Arvada. The upper canyon has rugged topography and thick forest. CCCFPD and adjacent districts have significant wildland fire potential due to high hazard conditions such as: old growth fuels; large area; steep terrain; and, limited access. The District most recently faced a significant wildland fire in January 2006. The 2,700-acre Plainview fire, fueled by 70+ mph winds, took 4 days to extinguish. No lives or structures were lost. Of our 224 miles of roadway, those in the upper canyon are winding and difficult to navigate especially at night and in winter months when ice and snowfalls are common. Ten percent of the roads in our District are paved, 85% are unpaved, and 5% are passable only with 4×4 vehicles. Two major state highways cross through our District; Highways 93 and 72. A major railway, now used by several rail lines, was constructed on the heavily forested hillsides in the 1880’s and contains 25 tunnels within our District. The closing of Tennessee Pass has funneled increased rail traffic through the District. As many as 28 trains per day use the rail line, some carrying hazardous materials.